Does your child get distracted easily and need to be repeatedly reminded to complete a simple task? Does their room look like it’s been hit by a tornado and they are constantly misplacing personal items? Do they have emotional outbursts when plans suddenly change? For parents, many of these behaviors may seem familiar. But many typically developing children are able to improve their self-management skills, or executive functions, as they grow older and take on more responsibility. Some, including children diagnosed with Autism Spectrum Disorder (ASD), attention deficit hyperactivity disorder, dyslexia, traumatic brain injury and other learning disabilities, have a harder time and may face executive function deficits. What Is an Executive Function? Traditional definition: The chief operating system located in the prefrontal region of the brain used to engage in cognitive processes required for goal-directed behavior. What this actually means: Everything that you do every day to manage your own behavior. What Is Emotional Self-regulation and Why Is it Important? Notice when they become emotionally charged. Consider the consequences of their response. Engage in activities that move them toward their goal, even if they are feeling negative emotions. Overreact to situations when compared to same-age peers. Experience negative emotions for a longer amount of time than same-age peers. Have a short temper and engage in emotional outbursts. Before beginning the lesson, it’s important to note that the child should already be capable of identifying and labeling emotions. The activities should be initiated when a child is in a good mood. This lesson is also meant to be taken in stages with the child moving to the next step after they have successfully developed a mastery of the preceding step. 1. Create an emotional levels chart. 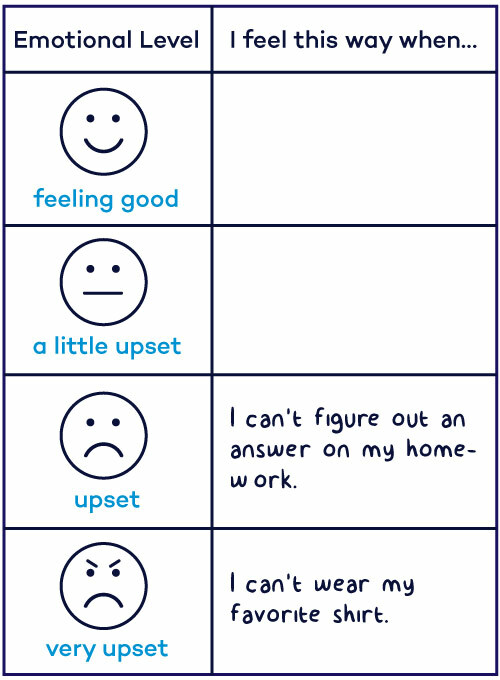 Create a visual aid that depicts the different levels of emotions that a child may feel, allowing the child to create their own labels for each level. 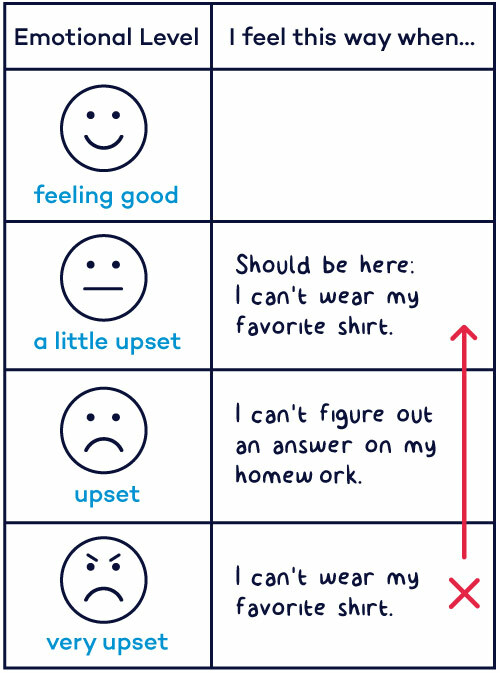 For example, levels can be labeled “feeling good,” “a little upset,” “upset” and “very upset.” The chart should have two columns with the emotional levels in one column. Title the other column, “I feel this way when…” and leave the rows blank for the child to fill in. 2. Teach the child to assign emotional levels to certain situations. The person working with the child can prompt them in a number of ways. Ask the child to write down different situations that make them feel specific emotional levels. Another option is to present a scenario and ask the child to identify how that situation would make them feel. For example, ask the child how she would feel if she wasn’t allowed to wear her favorite shirt and instruct her to fill in the blank space next to the corresponding emotion. 3. Talk to the child about what appropriate reactions should be to different scenarios. Use the scenarios in the emotional levels chart to identify what should be treated as a big deal and what should be brushed off. For example, talk to the child about how not being able to wear your favorite shirt should make you a little upset, rather than very upset. 4. Teach the child coping strategies. Identify strategies that children can use when they are feeling upset or very upset and practice the strategies. Give the child hypothetical situations and role-play how to use those strategies. 5. Create a controlled opportunity to practice coping strategies. Start by explaining to the child that to avoid getting “very upset,” they should use coping strategies when they notice they are getting “a little upset.” Then identify the coping strategy the child believes is most useful. Explain that a stressful event will happen and to think about how they will use their chosen coping strategy to avoid getting very upset. Finally, create the scenario in a practice setting and help the child use their chosen strategy. 6. Practice coping strategies in a natural environment. After the child has learned how to cope with a situation with advanced notice, ask them what they will do if the situation arises in real life. Remind them that they should always be prepared for the possibility that a situation will arise. Work with the child to identify recurring situations that make them emotionally charged, and write a plan identifying which coping strategies they will use at each emotional level. 8. Measure the effectiveness of the intervention. Correctly identifies situations that make the child feel an emotional level — across two to three sessions. Correctly identifies situations that are a big deal versus not a big deal — across two to three sessions. Correctly role-plays coping mechanisms — across two to three sessions. Successfully implements coping mechanism when warned about a difficult situation — across three to five sessions. Successfully implements coping mechanism when not warned about a difficult situation — across three to five sessions. This lesson is not meant to replace meaningful consequences for a child’s behavior. Children who react negatively to situations should not get what they want. Children who are able to use the discussed coping mechanisms should gain access to reinforcers. Reinforcers vary from child to child and can include praise or more tangible assets like candy or stickers. Children should not have regular access to reinforcers throughout the day, and you should make certain the child wants to earn the reinforcer and has not become bored with it. If the child is not responding to the reinforcer, you may also consider whether you need more continued reinforcement or whether you should be reinforcing more quickly after a positive response. Source: OnlinePsychology@Pepperdine, the online Master of Science in Behavioral Psychology program from Pepperdine University.